We're in DAY 2 of October - the month of the pumpkin! 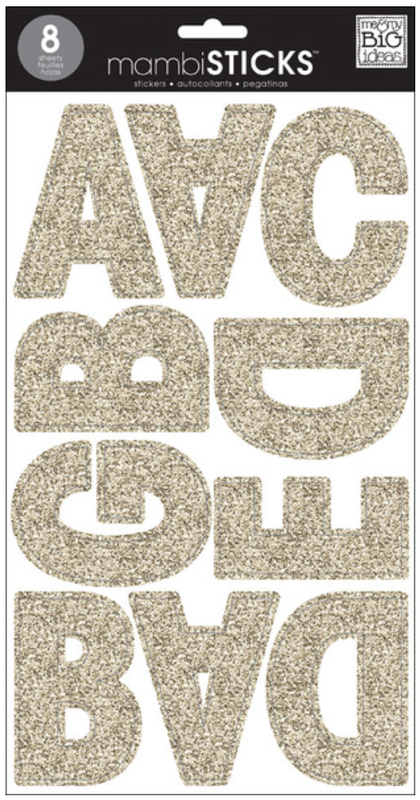 Here's a super simple and trendy pumpkin decorating project I completed using some black, white, and gold paint, and a few sheets of coordinating mambiSTICKS alphabet stickers. I used a different technique with each of the mambiSTICKS to attach them to the pumpkins, and you can read about those techniques below. The gold glitter alphas I used for the 'BOO THANG' pumpkin work really well on the pumpkin's curved surface. They're a thinner, more flexible sticker, and contour better than any of the other mambiSTICKS alphas. For the '10.31' pumpkin, I chose the lowercase chalkboard script mambiSTICKS. I love the effect the black outline around them has on the white paint of the pumpkin. For these, I hot-glued the bottom of each sticker to the pumpkin to better secure it, which caused the top portion of the mambiSTICKS to float off, and cast a bit of a shadow. My 'A & C' pumpkins are for my cats Alejandro and Carmen. Each year I make a pumpkin or craft about them (see last year's kitty mugshot layout). I hot glued the 'A' and 'C' to a tooth pick and simply stuck the toothpick into the pumpkin. For MORE HALLOWEEN inspiration, head over to our GALLERY.